Why is a VALUE TRAP? The Bargain Hunter Dilemma! Have you ever bought a cheap stock, which later got cheaper and cheaper? If yes, then you might already have met with- Value traps. 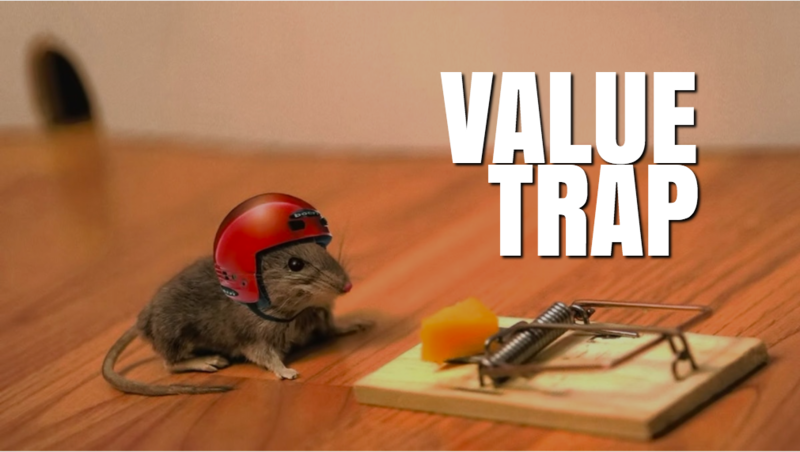 Value traps are those stocks which may seem like a value stock because of their cheap valuation. However, in actual, they are garbage stocks. Unlike value stocks, these value traps do not have true potential to give good returns to their investors and that’s why their price keeps on declining for a continued period of time. Why do investors fall in value trap? 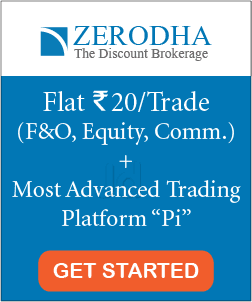 There are some stocks which may appear cheap because they are trading at a low valuation metrics such as PE, price to book value ratio, cash flow ratio etc. The bargain hunters keep an eagle eye on these stocks as they appear cheaper compared to their historical valuation or relative to the market. These investors buy these stocks at a low price considering them as a value stock. However, the problem arises when the price keeps on dropping for an extended duration of time. 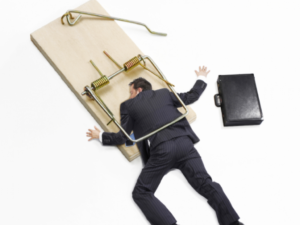 Here, instead of purchasing a value stock, the investor has fallen for a value trap. Also read: #9 Things I Wish I had Avoided During my Initial Days in Stock Market. 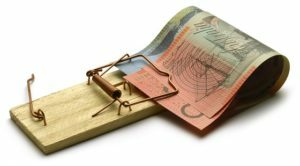 What actually is a ‘value trap’? The value traps are those stocks which are ‘not’ cheap because the market has not realized their true potential or because of some temporary setbacks. These stocks are trading at a cheap valuation because the company has either lost its fire or else its fire is fading away. A value trap is that stock which is not able to generate any significant profit growth or revenue. A few of the general reasons for the underperformance may be rising production/operational cost, declining market share, lack of new product/services, change in competitive dynamics or inefficient management. The investors who buy such stocks just by evaluating its low valuation (without giving any regard to the reason why the valuation is low) falls in the value trap. The real value stocks are those stocks which are trading below their intrinsic value. The reason for their cheap valuation may be either temporary factors or because the market has not yet realized their true potential. Few common characteristics of value stocks are consistency, strategic advantage, strong business plan, growing cash flow and high-quality financials. Further, these stocks can be considered value stocks only if they are bought at a significant margin of safety by the value investors. On the other hand, value traps are those stocks that are trading at a low valuation because of long-term or permanent setbacks (factors). These stocks are not actually trading below their intrinsic factor. They are just trading at a low valuation compared to their historical valuation or relative to the market (which might be even above its true intrinsic value). Value trap stocks lack catalysts or momentum to retrace its original growth track. Although these value trap stocks might be trading at a low valuation compared to its past valuation or market, however, the chances of these stocks bouncing back to their historical valuation are quite low. Most of the value trap stocks suffer from lack of innovation, degrading competitive advantages, high debt, low-interest coverage potential, poor management, declining profitability and no future growth prospects. Proper research is required while investing in these cheap stocks to understand the reason behind their low valuation. For example- if the average PE of an industry is 18x and stock is trading at 5x, then considering the PE valuation, it might look like a value stock. However, whether its actually a value stock or a value trap can only be found after proper investigation. Similarly, if a banking company is trading at a price to book value of 4x compared to the industry average of 9x, then again the bargain hunters first need to investigate the reason behind the low valuation of that stock before concluding it as a value stock. Also read: Why You Should Invest Inside Your- Circle of Competence? If the earnings and cash flow of a company are consistently declining for past few couples of years, then the stock might be a value trap. The low valuations of these stocks are because of their dull future prospects. The market works on future expectations and if investors cannot see any future growth potential in the company, then the stock might even degrade further, no matter how low is the valuation. A company with outdated technology or a non-profitable business cannot be a value stock. Take the examples of the 2G/3G technology based telecommunication companies. Most of such companies ran out of business just because of outdated technology. A poor and inefficient management of a company is a sure sign of a value trap. If the management lacks the driving force and their strategic vision is cloudy, then the investors of that company might suffer from value traps. Huge debt and leverages are never favorable for a business. A big debt is an actual trigger for the most deadly value traps. If the earnings have declined and still the management keeps on giving huge bonuses to their top management structures, then definitely they have not adapted to address the problem. During declined earnings or troubled times, a company needs to change their fundamental behavior in order to get back in the race. The financial accounts should be clear and transparent enough to give the true snap regarding the company. If the accounting of a company is not credible, they might be hiding some financial difficulty or even solvency. With the shift in the scenarios, the company needs to change its capital allocation method like how much capital they want to allocate in their growth, dividends, capital expenditure or to get rid of a big debt. Declining market share, declining competitive advantage, and company not being able to contain its costs are again a few big signs of a value trap. When the company starts moving in the wrong direction, it might need some kind of catalysts to move back to the growth track. These catalysts can be new innovations, products/services or even an earning growth. If the company is lacking any sign of growth catalyst, then again that cheap stock might be a value trap. Also read: 11 Must-Know Catalysts That Can Move The Share Price. Although, there can be a number of other signs that a company is a value trap, however, these nine are the top signs. The actual goal of a value investor is to avoid value traps. Therefore, my first suggestion to every value investor would be to research the stock properly before investing. However, even seasoned investors sometimes fall into the value trap and buy garbage stocks considering them undervalued. In such situation, the best you can do is to understand the problem and cut off the stock as soon as possible. Do not purchase more stocks in order to average down or hold the stock long enough with an expectation to break even. The faster you can get rid of that stock, the better it is for you. ”If you find yourself in a hole, stop digging”. New to stocks? Want to learn how to select good stocks for long-term investment? Check out this amazing online course: HOW TO PICK WINNING PICKS? 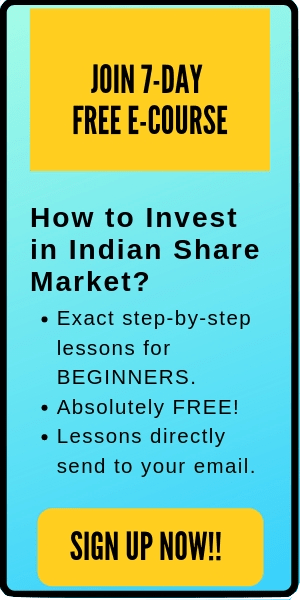 Enroll now and start your investing journey today.